Adult Bald Eagle released by CRC staffer Rachel Woods at McGuire Nuclear Station's Energy Explorium. File photo. There are few things more inspiring that watching a Red-tailed Hawk circle over an open field or hearing a wild owl hoot at dusk. Learn about these incredible birds of prey and be a part of this magical experience by sponsoring the recovery of a raptor with our Release-A-Raptor Program. Over 900 birds a year are brought to our renowned rehabilitation center each year to receive care. Of those that survive the first 24 hours, almost 70 percent are released back into the wild. When birds are ready to fly free, we work with lots of people -- allowing them to enjoy the thrill of watching a raptor return to the wild. 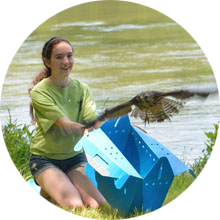 As a Release-A-Raptor participant, you will receive information about the bird being released. 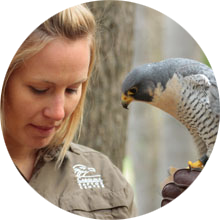 Each release is facilitated by a trained member of the Release-A-Raptor team. The suggested donation to release a raptor is $250.00. These donations help cover the medical costs and rehabilitation of the injured or orphaned raptor. Please keep in mind that birds become available for release as they finish recovering in our rehabilitation center. 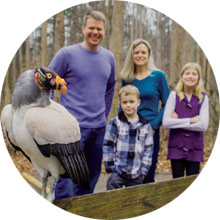 There are no guarantees that a particular species of bird will be able on one particular day. If you have a definite date in mind, it is best to remain flexible on the species, and allow us to choose a recovered raptor suitable for your location. If you are flexible on the date, we may be able to accommodate special requests for certain species, and can notify you as one becomes available. Raptor releases are perfect for occasions including: Birthdays, Graduation Parties, Weddings, Anniversaries, Memorial Services, and Vineyard Celebrations. Imagine caring for a baby in a nest made of twigs and dried grass, all balanced on a tree branch hundreds of feet into the air. A precarious nursery if ever there was one. 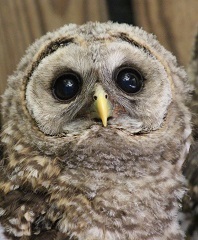 Patient 20472, a baby barred owl, learned that lesson the hard way, having, most likely, fallen out of its nest and breaking its wing. Rehabilitating nestlings is delicate work. 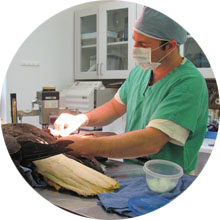 We need to treat the injuries while not imprinting too much on the young raptor and making it too familiar with humans. Luckily, 20472 is on the mend and can, we hope, return to its natural habitat soon.